Many people are born with teeth that don’t fit in their jaw properly – a condition referred to as malocclusion. Most can have the malocclusion corrected with braces. However, in about 10% of patients, braces are inadequate. For these patients, providing proper tooth fit – or occlusion – requires surgical repositioning of the upper and lower jaw. In such a procedure, the upper and/or the lower jaw is sectioned and the bone that holds the teeth is repositioned to make the teeth fit. Rearranging the facial skeleton can be good for the teeth but, too often, it has a negative effect on facial appearance. For example, when poor tooth fit (malocclusion) occurs because the lower jaw is too small, typically surgeons will correct the tooth fit by surgically breaking (osteomizing) the lower jaw and repositioning the pieces to match the larger upper jaw. If no bone is added to the lower jaw, however, gaps will exist in the rearranged lower jaw that impact the look of the face. 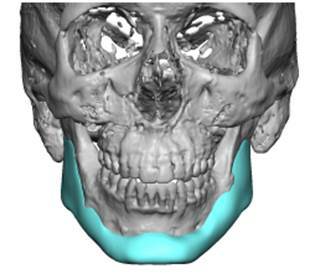 Expanding the lower jaw without adding to it often results in asymmetries and contour irregularities. The lower jaw is still deficient but in a different way. For many patients who have experience suboptimal results from orthognathic surgery, it is disappointing to solve a dental problem only to replace it with a more visible facial issue. The resulting facial irregularities can be effectively addressed, however, through custom-designed facial implants that create symmetry and smooth the jawline. To create implants that meet a patient’s specific needs, a three-dimensional CT scan is done to create an image of the skeleton which is used as a template on which to design implants made specifically to correct their asymmetries and imbalances. 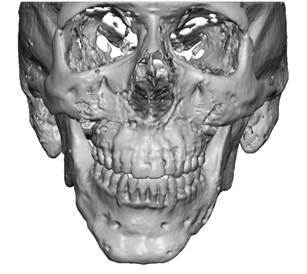 This scan shows that the irregularities and asymmetries caused by the orthognathic surgery in both the upper and lower jaw. This figure shows CT designed implants which correct asymmetries and imbalances that were designed for the specific needs of the patient. The custom-designed implant creates a smooth, balanced jawline with stronger angles that provide a more pleasing, youthful appearance. A recent scientific paper on this topic written by Dr. Yaremchuk published in the journal Plastic and Reconstructive Surgery can be read here: https://journals.lww.com/plasreconsurg/Abstract/publishahead/_Refining_Post_orthognathic_Surgery_Facial_Contour.98018.aspx.